This is the world's quickest post, since I'm overdue with one…things are busier than ever, and the housing crisis for the apprentices at the UCSC Farm is eating up some of my unfree time, so to speak. But I did get out on Monday to visit one of my friend's new farms. 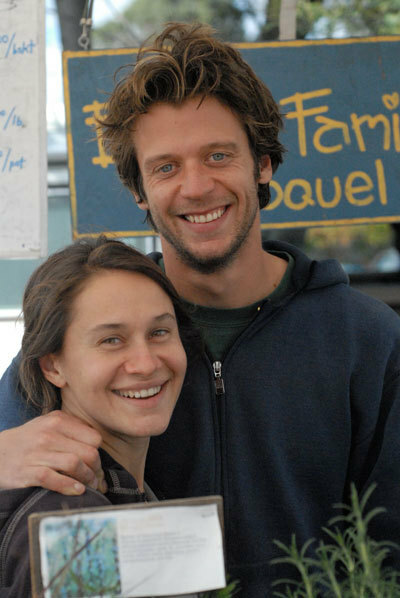 Joe Schirmer, a graduate of UCSC and of the CASFS (UCSC Farm & Garden) program, has had the good fortune to find two new farms to add onto his existing acreage. The farm I visited on Monday is the same spot I visited a few years ago, when it was covered in Vanessa Bogenholm's strawberries. Happily, Joe's still growing those—three kinds, including the wondrous Albions that are my favorite, ever—but he's diversified so much that I was bowled over. NOTE: something about this entry is wackadoo in its layout, so apologies while I try to debug it. Pictured here: Kirsten hugging her little pet goat, Audrey. 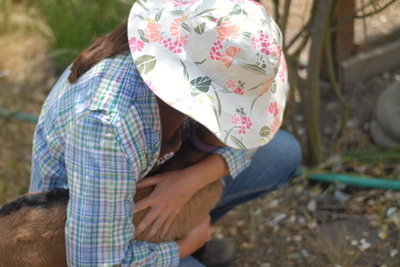 I have so many photos of the tender-hearted Kirsten without a face, because she is so often hugging a critter on the farm. Pictured here: three pounds of dry-farmed Early Girl tomatoes from Molina Creek Farm here in Santa Cruz, being slow-roasted the Godiva way. Scroll down for the view of how they look after two hours in the oven. Received from Cynthia Sandberg via e-mail yesterday (I've been too ill to write until now). Bad bad news from the Canadian government (and I'd always thought they were so much more intelligent than our government!). Speaking of Cynthia, her farm will be featured on In Wine Country on December 16th (Saturday at 6:30 p.m.) on NBC, and again on the 18th. The following was received from Sally Fallon and Bill Sanda at the Weston A. Price Foundation. We are sending this important Alert to all members. The incident has widespread implications, not only for the raw milk movement but for the basic right to farm, and the outcome could affect America and other nations as well as Canada. First of all, Cynthia Sandberg at Love Apple Farm would like me to post the hours that her farmstand is open: Mondays and Thursdays, from 9:00 a.m. to 6:00 p.m., and Saturdays from 9:00 a.m. to 4:00 p.m. (Note: to my knowledge, there is no other market or farmstand open on Mondays in the county.) Here is a map to Love Apple Farm. So. I had thought I realized how globally unhealthy our corporate food is...but nuances and realizations keep turning up in my thinking. I was with Logan in the Safeway the other night, buying contact lens solutions. He asked me something like, "What's in this store, Nana?" I tell people I live in Eden. As in, "The Garden of Eden," where "garden" in fact means "more organic/sustainable farms than any county in California," and probably the entire country. 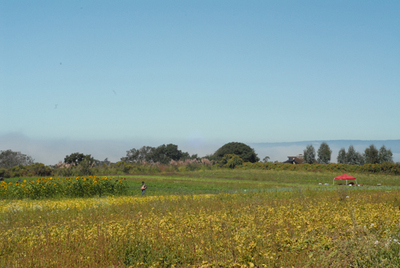 With roughly a third the acreage and population of Fresno, Santa Cruz County has 30% more organic farms. It has become my life's work to visit, photograph, and write about these places—not just here, but wherever I travel in the world. Travel itself has taken on a new meaning: I'm not interested in going somewhere unless I can squeeze in a visit to a farm or a farmers market. Last year, I visited New York City, but only briefly. It was more enjoyable to me to stay in northern New Jersey, and drive through the beautiful countryside there, en route to Bobolink Dairy and other agricultural sites. Bob and I had intended to travel over the weekend, escaping town for my birthday yesterday. But a surprise phone call from Katy, with the Outstanding in the Field farm dinners, convinced me to stick around: they were throwing an appreciation dinner for staff and other supporters of the farm dinners, and the dinner was to be held on my birthday. Whee! Though most everything had been plowed under and replaced with cover crops, there were two large beds containing red chard and kale. Route One has another farm site up the coast, tucked in a valley that is perhaps a little warmer that this farm. This chard, with its ruby stems and maroon leaves, contrasted with the brilliant green fields surrounding us. Logan and I got out to two farms yesterday. In the morning, we returned to Crystal Bay Farm, out in Watsonville and close to Claravale Dairy and Vanessa Bogenholm's strawberry farm. Farmer Jeff Fiorovich was there: the happy prisoner of the pumpkin stand he'd told me about earlier in the summer. He called his wife, Lori, out to meet us, and Logan added two new members to his international fan club. I'll have an extensive list from Jeff later, with all the varieties and descriptions, but check out the Beautiful Farms gallery for a peek at some truly beautiful and unusual pumpkins and gourds. More to come there.